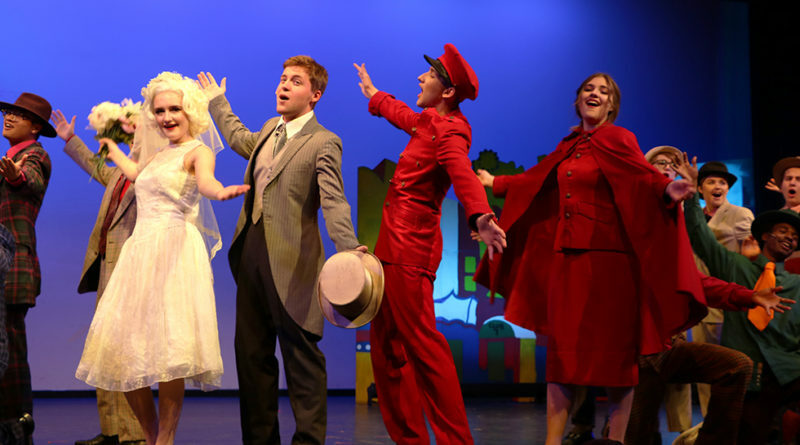 Award winning musical “Guys and Dolls” took the stage at CVHS from April 20 to April 29. Together, student actors, singers and musicians worked hard to bring the story of gambling and love to life. Students performed in a rigorous rehearsal schedule and made many sacrifices to perfect the show. “I was so lucky to have the opportunity to take part in this production; while it can be a lot of work, the musical was well worth it and extremely rewarding,” said lead actress Maddy Albright. On the Friday and Saturday performances, the curtain lifted at 7:00 pm, and Sundays offered matinee performances starting at 2:00 p.m. All shows were performed at the Center for the Arts (CFA). The “Guys and Dolls” storyline featured a dramatic combination of crap games and elopements that kept audience members on the edge of their seats for the entirety of the performance. “‘Guys and Dolls’ is a classic show that is fun for everyone,” said instrumental music director Steven Hendee. “It’s got so many great songs in it, everyone will want to sing along,” he said. Actors’ portrayal of characters in “Guys and Dolls” was directed by drama teacher David Judson, and dances were choreographed by Katherine Stein.